We’re about to start seeing attacks against our digital assistants, and one of the methods we’ll see being used is people issuing commands to assistants that don’t belong to them. A few days after I wrote that piece, a woman in San Diego told Alexa—on live TV to—order a dollhouse, and tons of people who were watching had their Echo devices go and do it. One way to reduce some of this risk is to change the wake word for your Echo devices. Picking one of the others doesn’t make your system secure—it’s an obscurity-based control that reduces some risk from a certain kind of situation. As more and more Echo’s get purchased, the attack surface of saying, “Alexa” in any location is growing significantly. This makes it far more likely that your system will be interacted with by someone unauthorized—not necessarily even in an insecure way, but even just in an annoying or embarrassing one. If an actual attack is launched, it’ll most likely be against the default wake word. Don’t stand where you know a bomb is going to drop. Some of the other words are just cooler than Alexa. 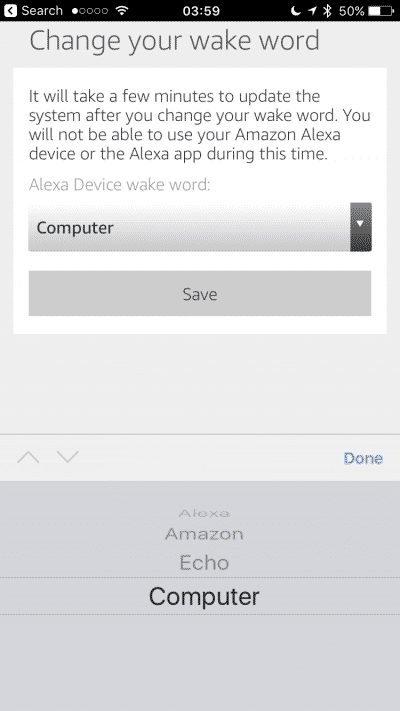 Amazon gives you options for Echo wake words. Everyone’s using the default of Alexa. It’s often better not to use defaults because they’re the first things to be targeted or confused simply due to the numbers. Consider changing your wake word to one of the other options. Think about the penetrating quality of voice, i.e., sound. All it has to do is get to the Echo microphones and you can touch a computer interface that’s potentially connected to a wide range of systems. So you might soon be able to yell, “Alexa, open the garage!” through people’s walls, for example. When you change your wake word you’re choosing to move off the ground that you can see multiple artillery guns targeting. One gun, twenty guns, a thousand guns, a million guns. They’re all pointed at the same piece of ground you’re standing on, and the smartest thing you can do is pick another place to stand. Note that moving doesn’t make you immune to artillery—it just makes you less likely to be harmed by a strike that you know will land in a specific area.